I love myth and folklore; therefore, I conclude that this is one of the best books I have read in 2016. Grateful to our public library that they added new collections. It was like love at first sight. 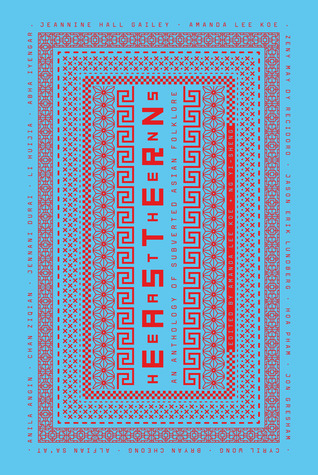 Eastern Heathens: An Anthology of Subverted Asian Folklore is a collection of re-created, re-dramatized myths and folktales from Asia to accommodate with our modern times. Additionally, it also shed lights on how our values, behaviors, and customs that are found in the myths and folktales have remained same and unquestioned. My favorites are the myths from Cambodia, the re-told love story from the Arabian Nights, and finally re-enactment of Sita’s (from the epic Ramayana) trial and tribulations to prove her faithfulness and virginity. Putting a modern twist on Asian folklore, this is a collection of 14 short stories that has been re-imagined. However, they did little for me and at times trying a little too hard such that it feels like modernity is imposing upon tradition in an awkward manner that fails to flow, making it jarring and unpalatable to read. This was fun, a collection of rewritings and interpretations of mythology and folklore from different Asian countries. Interesting to see the folklore I'm familiar with (or is mine) and see how it's interpreted, whether I agree or disagree. I especially enjoyed 'The Great Disappearing Act' by Zeny May Dy Recidoro based on Tungkung Langit at Alunsina, 'Tenali Raman Redux' by Jennani Durai, and 'The Dragon Prince's Letter to His Father' by Cyril Wong based on the Dragon King. Would love to see more of this, maybe country specific. I'm only giving this three stars because despite very much enjoying some stories, others felt like they didn't add anything new, leaning into the misogynistic undertones of the original tales rather than challenging them, and it impacted my enjoyment of the anthology overall. Would have given a higher score if the stories were ordered differently rather than by length. Really enjoyed the last 4 longer stories which I thought were very good retelling of an old folklores in a modern sci-fi, steampunk and even romance form. There's even a bit of world-building in the last one that could lead to a whole new franchise; a sort of oriental version of the currently airing Netflix hit "Bright".The rest of the stories were just not that enjoyable, some even seemed crude and disrespectful of the source material they were based on, as if the authors hated the very stories they were retelling and choose to tell a different story altogether. Amanda Lee Koe Ng Yi-Sheng Cyril Wong Alfian Sa'at Jason Erik Lundberg Bryan Cheong Jon Gresham Zeny May Recidoro - Amanda Lee Koe is the author of Ministry of Moral Panic (Epigram Books, 2013), a collection of short stories that deal discursively with contemporary Singaporean identity; the book won the 2014 Singapore Literature Prize for Fiction and the 2016 Singapore Book Award for Best Fiction, and was longlisted for the 2014 Frank O'Connor International Short Story Award.She is also a 2013 Honorary Fellow of the International Writing Program at the University of Iowa, and recipient of a 2016 PEN/Heim Translation Fund grant for her translation of Su Qing's Ten Years of Marriage. With Ng Yi-Sheng, she spearheaded and co-edited Eastern Heathens, an anthology subverting Asian folklore. Her festival and panel invitations include the Singapore Writers Festival, Melbourne Writers Festival, Art Basel, Ubud Writers and Readers Festival, AWP Conference & Bookfair (USA), and the Asian Literary Festival in London. Her writing has been published in seven countries.Aside from her editorial duties at Esquire (Singapore), she has put together mentorship programmes for emerging writers in Singapore under the Ceriph Mentorship Programme, where she served as lead programmer as well as non-fiction mentor. In other fields, she has also co-curated cross-disciplinary exhibitions and programmes such as A History of Curating in Singapore (part of ArtStage 2014’s fringe programme), Microcosmos and The Art of Rebellion. Her experimental ficto-documentary, Post-Love, which she co-wrote, co-directed and performed in, was nominated for Best Documentary at the 2012 Singapore Short Film Awards.Based between Singapore and New York, she is working on her first novel.